What does the biosphere breathing look like? Carbon, Air > Human Interactions/Societal Needs > How do scientists monitor global change? "This is a plug for ecology and its importance in global signals and global processes." : Here you will find clear descriptions of what you just saw, how they know what they said they knew, why they know it to be trustworthy information. Finally we will ask the question, "So what!" and explore why the information is important. In this clip from the 1990 presentation “N2O Ecological Approaches to Estimates of Global Fluxes,” Dr. Pam Matson brings her perspective as an ecologist to describe the wiggles in the famous Keeling Curve. She states that seasonal changes in concentrations of atmospheric carbon dioxide represent the “biosphere breathing.” In the curve, the “inhalation and exhalation” of plants shows up in atmospheric CO2 level rise during Fall/Winter, when plant growth slows, and CO2 uptake by plants declines. Decreases of atmospheric CO2 occur in Spring/Summer when plant growth is booming, and CO2 levels drop due to increased plant CO2 uptake. Note that another scientist pauses Dr. Matson to ask for the definition of the term heterotroph. The data that Dr. Matson references is from Dr. Keeling’s monitoring site at Mauna Loa in Hawaii. The Mauna Loa site is located high on a barren volcano, so there are no nearby plants that might directly impact CO2 levels near the instruments. CO2 is a trace gas, and very sensitive instruments are required to measure it. As a result, the Mauna Loa site initially used detectors created by Keeling himself because there were no existing tools that could effectively make the measurements he sought. To read how CO2 is measured at Mauna Loa today, click here. It is important to note that peaks and valleys on the graph do not occur mid-winter or mid-summer as one might expect. Because atmospheric CO2 levels continue all through the winter, peaks occur in early spring, just before budburst occurs. Conversely, because high plant CO2 uptake occurs all summer, lowering atmospheric CO2, valleys occur in fall, as plants being to lose their leaves. WHY can this be trusted? 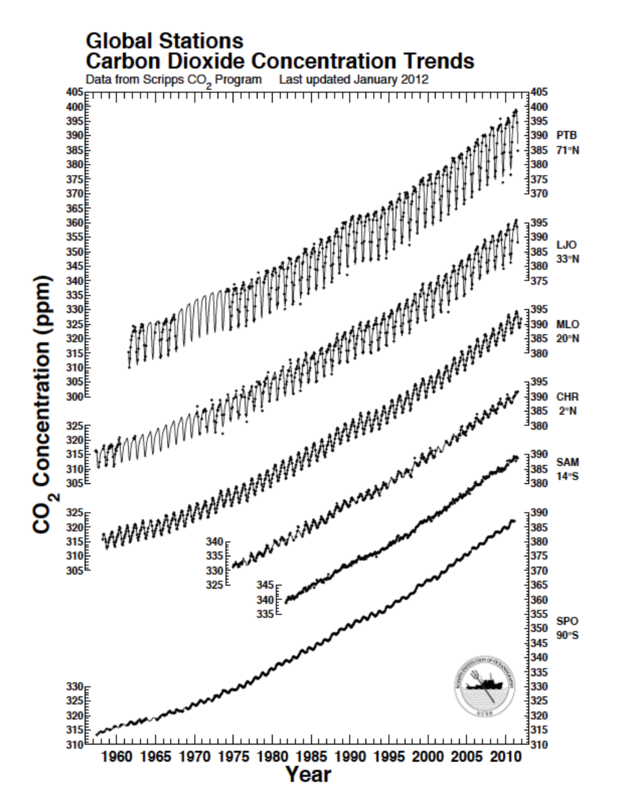 Dr. Matson’s explanation of the wiggles in the Keeling graph helps clarify why scientists feel confident that the Mauna Loa instruments successfully measures the concentration of atmospheric CO2. The wiggles represent a seasonal rise and fall of CO2 levels that matches the growing and dormant seasons of the northern hemisphere, which fits the expectations that atmospheric CO2 concentrations will fall when plants are growing rapidly and take up more CO2, and concentrations will rise when many plants lose their leaves in the fall, decreasing photosynthesis and CO2 uptake. Confirming observations against logic or already known facts help scientists determine whether or not their conclusions are reasonable. 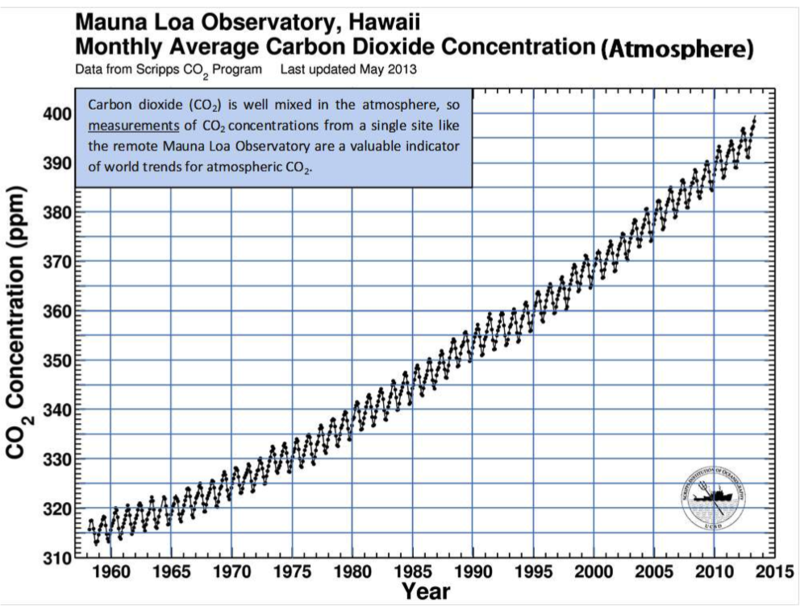 Scientists using the Keeling curve also draw confidence from the correlation of the Mauna Loa record with other records of CO2 taken by other stations around the world. Another source of confidence is the correlation of the Mauna Loa Record with other records of CO2 taken by other stations around the world. In the associated graphic from the Scripps Institute for Oceanography, you can see the Mauna Loa (MLO) in comparison to other trends at Point Barrow Alaska (PTB), Lo Jolla, California (LJO), Christmas Island (CHR), Samoa (SAM) and the South Pole (SPO). The link that Dr. Matson draws between plant activity and the atmospheric carbon cycle provides insight into the deep interrelations between different Earth systems and different fields of science. It illustrates how a combination of individual organisms impact the chemistry of the global atmosphere. Without understanding ecological cycles, the wiggles on the Keeling Curve, an important environmental indicator, would be a mystery. Why does Dr. Matson say the graph's “wiggles” are the biosphere breathing? A scientist in the audience asks Dr. Matson the meaning of the word “heterotroph.” What living things are examples of heterotrophs? Reflect on the clip using these questions. Then, record your thoughts in a science journal or discuss them with a friend. Dr. Matson refers to ecology at several points in her presentation. What is the relationship between the atmosphere and plant/ecosystem function? 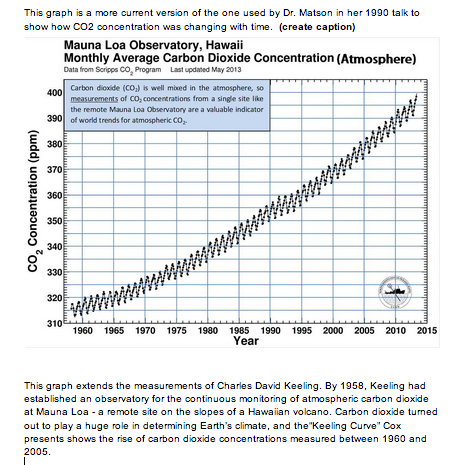 Considering an updated version of the Keeling Curve (attached), answer the following questions, either with a friend or in a science journal. What does the line of the graph represent, and why is it not a smooth, straight line? When is your birthday, and which hemisphere do you live in? 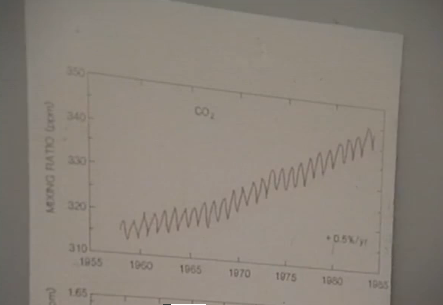 Are CO2 levels rising or declining around the time of your birthday? What does the direction of the line over the course of time (the x-axis) indicate? Many scientific measurements of liquids or gases use the unit “parts per million” (ppm). This type of unit is a way of understanding what percentage of a mixture is composed of the element or compound you are studying. For example: if we have one million molecules of a mixture of carbon dioxide, nitrogen, and oxygen and 200 of those molecules are oxygen molecules, then your mixture is 200ppm oxygen. This activity can either be performed in a large group or with a small set of friends. Observations may be discussed or recorded in a science journal. Since we cannot see ppm, how can we better understand this type of unit in a way we can sense? By using a gas that we can smell. Materials: A room where you are allowed to change the room's odor, a stopwatch or clock with a seconds hand, a non-toxic gas (or rapidly vaporizing liquid) with a strong odor that is safe to breathe, e.g. an inexpensive perfume or safe gas recommended by a science teacher. If you are under 18, ask an adult for help. Close the doors and windows of your room. Calculate the volume of the room you are in, using the unit cubic meters. 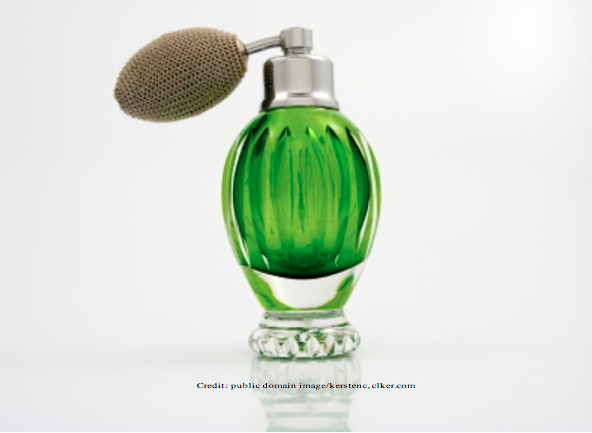 Record the volume of perfume (or other liquid/gas) you will be using for the experiment. If you are using a liquid, you may need to determine this number at the end of your experiment by subtracting remaining fluid from the amount of fluid you started with. Without doing a complete calculation, make some guesses: what do you think the ratio of normal air to perfume will be after 10 minutes? How long to you think it will take for the perfume to diffuse to the farthest side of the room? Have one person hold the bottle of perfume while the others spread out to different distances in the room. Once all participants have taken their places. Everyone except for the person holding the perfume (the recorder) should close their eyes. Without announcing when the experiment has begun, the recorder should empty the gas onto a dish on the floor or spray a measureable amount of perfume into the air. As each participant is able to smell the perfume, each should raise his or her hands. Once a person has raised his or her hands, he (she) may then open his (her) eyes. As soon as a person raises a hand, the recorder writes down the time and that person's name. Once everyone's eyes are open, the recorder should announce how long it took the odor (in other words, the perfume gas) to reach each person. Was the diffusion faster or slower than you expected? Based on the volume of the room, calculate the ratio of regular air to perfume. Be sure to record all observations and calculations. Convert this ratio into parts per million (e.g. the volume of air becomes 1 million cm^2). Now you know what that number of ppm smells like! increased by about 40 ppm. Other clips in this set. play What does the biosphere breathing look like? - Choose a Clip to View- 50 millions years of Earth’s temperature: Are we going back to the future? (2/2) Approaching Climate Change Science Becoming Interested in Biology Can a population evolve to survive? Can planting trees counter our carbon out-put ? Challenges to Ecosystems Restoration Climate Change and Precipitation (Interview) Concentrating Phosphorus in Space and Time (3/4) Drought and Society How can climate change cause population extinctions? How did phosphorus shape early agriculture? (2/4) How did you end up where you are today? How does one scientist tie her interests in to real-world problems? How has the temperature changed in the last 140 years? How have human activities transformed the phosphorus cycle? (4/4) How much carbon dioxide can a tropical forest hold? Other than climate, what are some examples of global change? (Glossary Clip) Reconciling Facts with Behavior (1/2) Should native plants be used in landscaping? (Discussion) What does deforestation have to do with the weather? What does the biosphere breathing look like? What is a range shift and why do they happen? What is Phosphorus and why does it matter? What is so important about Phosphorus? (1/4) What type of work might an atmospheric scientist do? Who was Charles David Keeling, and was he nuts? Why do scientists use models? Why do species invasions matter?